Water levels play an important role when determining the best places to fish. Whether fishing man-made reservoirs or natural rivers, both fluctuate throughout the year based on precipitation amounts or operational works. Changes in water levels directly influence fish feeding behaviour and holding patterns. If you want to catch fish, you will need to begin developing your knowledgebase. Learn more. Why do fishermen care about water discharge? How can fishermen benefit from having this data? Water discharge or streamflow are terrific indicators of how fast or slow water is moving in a river, stream or reservoir. This helps fishermen determine whether a location is fishable to begin with. Understanding discharge can also help fishermen determine the right tactics for high or low discharge rates. 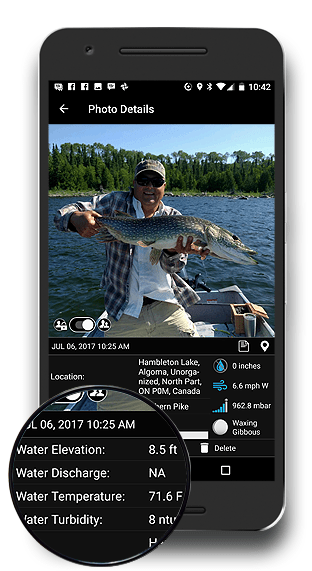 Use FISHBUOY Photos to create a history of discharge rates vs. fish catches to determine your optimal flows. Learn more. In a single view, you will better understand which water is fishable - and which is blown. You will also have the ability to correlate historical weather events and how they impact water turbidty. This allows fishermen to predict what water conditions might look like in a few days based on the precipitation forecast. Learn more. Water temperature is among the most important water parameters for fishermen, yet many of us don't take the time to measure conditions in the field. Fly fishermen use water temperature to gauge insect hatches. Great Lakes fishermen use deep water instruments like the FISHHAWK to determine the thermocline where fish are active. Salmon and Steelheaders use water temperature to estimate when fish will start running rivers. Bass fishermen will know when it is time to change to slow presentations or live bait. Along with other water parameters, FISHBUOY TripPlanner collects water temperatures every hour and stores it for your use. Using the FISHBUOY Mobile Timeline Filter, coupled with FISHBUOY TripPlanner, you will develop a more complete picture of the conditions you are planning for. Learn more.